Ok, is it just me, or is Emmitt kind of a “small” mover? I mean, he’s a big guy, but in both of his dances he strikes me as a bit cautious in the way he moves…I’ll admit I wasn’t a religious viewer back in season 3, but rewatching a lot of his stuff now, I have to think “Wow…and he won his season?? ?” Like Kelly & Drew, I think his big struggle is just going to be “catching up” to the rest of the contestants from more recent seasons – because the choreography, the energy level, and the overall performance value have all gotten A LOT tougher. It’s also been 6 years since he last danced, and while 43 isn’t terribly old, it can sure feel that way for a former football player with 20 years of wear-and-tear on his body – he may find that it’s not as easy to move now as it was 6 years ago. On the plus side, Emmitt’s got a fun personality on the floor – he seems like he has a great time out there, and isn’t afraid to cut loose and shake his stuff. He’s also got a great personality, which never hurts. Court’s verdict: Like Kelly, I think Emmitt’s biggest struggle is just going to be catching up to the caliber of competition the show has reached since his original season – and unfortunately, everyone this season (with the exception of Bristol) is a pretty decent dancer, so there’s not going to be a ton of bad dancers to burn through to shield Emmitt from elimination. He and Cheryl are both going to have to step their game up – and he may find that he needs a bit more time to practice than some of the younger, more mobile contestants. He’s got the personality factor working for him, but in order to stick around, he’s going to have to pair that personality with some more difficult choreography. Will be interesting to see what he & Cheryl pull out! So what do you, our PureDWTS readers, think of Emmitt this season? Will he repeat the success he had in season 3 – or be sent packing early? As per norm, we won’t know who is going to be cast for Season 15 until late summer / early fall, but with rumors or ideas or speculation running rampant I figured it would be fun to see how they would fare based on the data from the past fourteen seasons. So what will these graphs show? Well a few things really… I will provide a graph of the celebrity and compare it with the averages of the dances up to that particular season. Then I will provide a second graph that would compare the scores that each celebrity received with the overall average up to the end of Season 14. 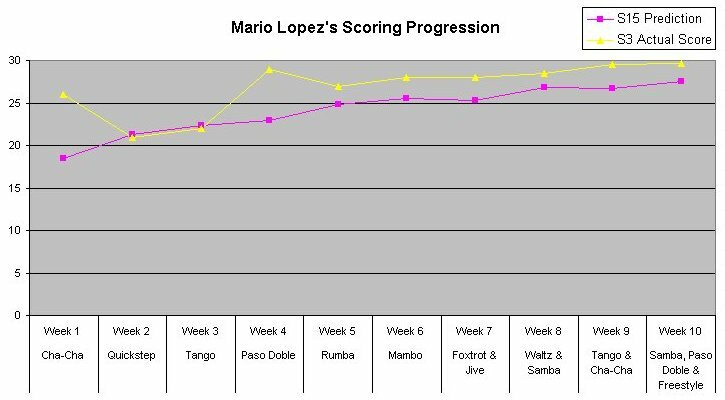 Since Mario Lopez came onto the show in Season 3 there isn’t a lot of data to work with, so there are bound to be empty spots. Some of the other celebrities I will also compare and create graphs for would include some of the mentioned from the post that Vogue put up a bit ago. In the first half of the season he would appear to be thrown around for a loop in the scoring department. The judges may praise him for incredibly dance ability, then toss him for a couple of weeks of a reality check before giving him high praise for improvement. Then finally in the second half of the season allow him to have his steady incline of scores. Now, if you remember back in Season 3, Mario Lopez was more known for his time on Saved By the Bell, so for his “occupation” I placed him as an actor. However as time went on he carved out another career path for himself as host and entertainment news correspondent so the Season 15 chart has his occupation more as a host instead. It would be interesting to see what he scores would be should he decide to do the show again in Season 15… but we naturally would not know that until sometime in August… so until then onward to Mel B of the Spice Girls. Season 14 has concluded for Dancing with the Stars and TPTB have spent at least half of the season if not the past year fanning flames for Season 15. In the now-official announcement of an “All Star Cast” being on the horizon. For those that are confused, Vogue posted a video a while back of Mario Lopez joining Kelly Ripa on her show “Live! with Kelly” and mentioned that he was approached to be a part of the cast of Season 15. 3. More Behind the Scenes – I think there is quite a bit behind the scenes footage now… moreso than I remember there being before. 4. How about a themed DWTS? All sports people or all singers or all tv personalities. – Unfortunately when John first mentioned a “themed DWTS” he meant all the celebs be from a particular group versus themed nights… can’t have everything. 6. More Pro Dances – This is also hard to see if it has happened or not. 7. DWTS Tour – Well we got a Vegas Live show now… that’s better than nothing. 8. Edyta For the Win – Unfortunately Edyta left after Season 10. So unless they bring her back for the All Star Season and make it so she wins… I don’t see this happening. 9. Fewer Contestants – Ever since Season 9 (which had a whooping 16 couples), TPTB had only 11 or 12 couples per season. 10. A DWTS Professionals Special – We’ve had a few specials that showed some of the best routines from previous seasons, be it celeb/pro dances or pro dances or pro group dance numbers. I say this was a win. Of the above Top Ten wish list, I wouldn’t be surprised if TPTB actually went through the list and looked to see what was doable. Now the big one: Since 2009 PureDWTS have mentioned a desire for an “All Star Season” and how cool it would be to bring old favorites from previous seasons and watch them compete for their chance at the mirror ball trophy. In fact Cheryl Burke once tweeted that a possible “All Star Season” was in the works two seasons from when she first mentioned it. Looking at the date of the post… the “two seasons” lead into Season 15, then add to that Mario Lopez’s comment of being asked to be a part of the All-Star line up. Well… let’s just say that at the date that this post was original written (April 27th) we now know that this is a definitive possibility. So where does that bring us? Well, I got curious, since I (Marianya) predict scores for the show… having an All-Star season would totally bust my predictions and calculations, because these would all be celebrities that now have some sort of prior dance experience coming in. Another factor is how many of them would actually remember want was taught to them the first time they were on the show? To me it doesn’t seem to be very many, but I could be dead wrong. One thing’s first certain, the expectations would be higher and the scores would be crazy! Then there are the celebrities that are participating in the DWTS Live Show at the Tropicana, namely: Carson Kressley, Joey Fatone, Kyle Massey, Sabrina Bryan and Tia Carrere. Would they be counted out since they are already participating in another DWTS related show? Umm… I don’t necessarily mind the “controversial character” because I do see the draw of that to the show, but I have an issue with past Mirrorball winners. I mean, I would much prefer that everyone in the cast not have won before so it would give the celebrities a second chance to win. People don’t necessarily have to agree with me, but dammit I don’t think it would be fair for the celebrities in particular if there were past winners in the All-Star cast. In fact, I would much rather have a separate season (perhaps for Season 20?) where all of the previous Mirrorball winners would compete to see who is the best of the best… but that’s just me. And then there is the question of: What constitutes a “fan favorite”? Do they have polls, numbers, know who averaged the most number of call ins? And on top of all that: Will they be nice and take one celebrity to represent every season of DWTS thus far, but wouldn’t that give those of Season 14 an unfair advantage? The questions are endless. Still, this will undoubtedly bring a lot of the fans that have tuned off the show back on if they have the right mix of celebrities. I’ve talked to a number of my friends that were fans of the show but haven’t really had any huge desire to watch the show in recent months, so perhaps bringing in an All-Star season is exactly what is needed to bring a jolt into the series. 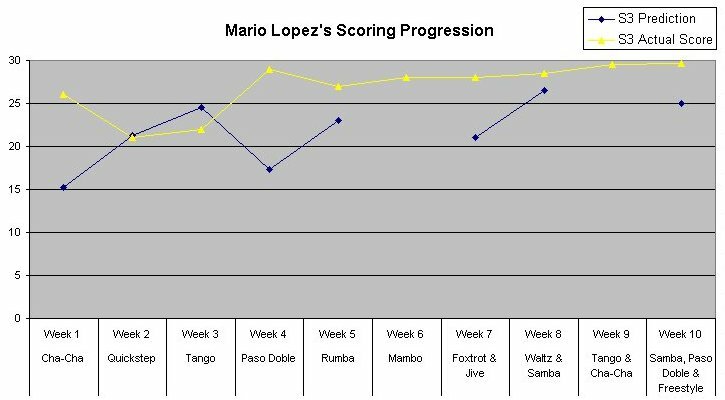 Next up… I’ll have posts analyzing the scoring progressions of two of the stars that were rumored to be approached for the All-Star Season: Mel B and Mario Lopez as well as adjustments to the upcoming season. *The foxtrot has only been used as a week 1 dance in 7 seasons: seasons 3, 4, 5, 6, 7, 9, & 12. The other seasons have either had a waltz (seasons 1, 2, & 8) or a Viennese waltz (seasons 10, 11, 13) as the week 1 ballroom dance. Season 9 had both the foxtrot and the Viennese waltz as first week ballroom dances. *The lowest week 1 foxtrot score ever given was a 13 – it was given to Mike & Lacey in season 12. *Besides the 3 newest pros (Val, Tristan, & Peta), the only pro this season that’s never done the foxtrot as a regular week 1 dance is Derek – unless you count the foxtrot relay in season 9 (I don’t, because it was only 30 seconds ;-)). Zzzzzzzz….uh, um, what? Sorry, fell asleep – thought I was watching paint dry, at the rate these foxtrots were moving! I’m not sure if these ladies thought they would shatter into a million pieces if they moved more than an inch or two, but there was just so little going on in these numbers – just some very slow strolling and painfully cautious turns. The foxtrot is already a pretty simple dance, so it’s up to the pros and their celeb partners to inject some much-needed jazz into it to make it entertaining…and when they don’t, you get these sleepy, unremarkable foxtrots that I bet half of you probably didn’t remember. Rocco seemed like a really nice guy, but he was pretty dorky on the dance floor 😛 You could tell he was really trying as he bobbed and skipped and flailed his platter hands across the floor here, but he also had the “I feel like a massive tool” look on his face the whole time. Granted, I think both he & Karina were nervous about her ankle injury earlier that day, but honestly – Rocco was just not a dancer. Sorry, dude.. Read more..
Dance of the Day: We’re going FREESTYLING!! AHHH!!! The Finale!! Home of the FREESTYLE! The one time of the year where the rule book can be tossed out, and ANYTHING GOES! In the prior twelve seasons, we’ve seen some bad freestyles, some good freestyles, and some GREAT freestyles! All three Pro Dancers in the Finale this season have all been here before, we’ve seen them freestyling before…. Karina, unfortunately, wasn’t successful in her bid for the Mirror Ball full of Glitter dust, with Mario Lopez…. (joking…. Probably is empty, but they SHOULD have some glitter dust inside, for memories of their season…) but still choreographed an awesome freestyle! Cheryl was successful, she is our DWTS FIRST back to back winner, first with Drew Lachey, and second with Emmitt Smith. She also performed a freestyle with Gilles Marini, and lost out in an extremely close final vote. She also appeared with Christian de la Fuente. Derek has also had three trips to the finales and, so far, is unbeaten. I really think we will be in for a FANTASTIC finale this week! All three pros are fabulous teachers, and know how to show their celebrity-partner to their advantage, and all are fantastic choreographers! Now, I know that Courtney and Heidi have put Mario and Karina’s into their dishonorable mention category, I do think it had quite a bit of “him” in it. And a big problem that it probably had, is that they did start dating while they were working together. Since this season, I do think that Karina has become MUCH better at working with her partner, and choreographing to their strengths, like Cheryl and Derek do. Besides, this is her ONLY trip to the finale. While we’re waiting for Monday to arrive, we’ll re-watch the freestyles from Karina, Cheryl and Derek, the first time they each appeared in the finale. First up, Season 2, CHERYL BURKE, in her first season on DWTS, dancing with Drew Lachey.